Tombs of the Kings is a large necropolis almost two and a half thousand years old, as it is dated back in the fourth century Before Christ. It is a UNESCO World Heritage Site. Despite its name, it was aristocrats and high officials that were buried here. They took this name because of the magnificence of the tombs, which are entirely cut off the rock and although there are no kings here it is a monument well worth a visit. The site is located next and to the west of Kato Paphos archaeological site and covers a large area which is still excavated. Its entrance is on the road connecting Kato Paphos with Coral Bay which is named after the monument, Tombs of the Kings Road, and you will find it on your left hand side as you are heading towards Coral Bay. You can go there by bus, taking from Kato Paphos the bus to Coral Bay, which is a 2-3 kilometers ride. The tombs are carved in the solid rock of the area and are really impressive. 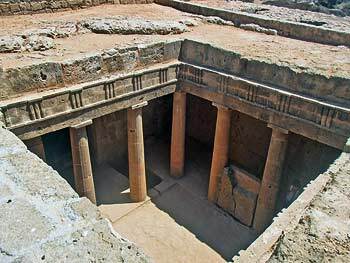 Some of them are decorated with columns in ancient Greek style and frescoes, while others are actually copies of the houses of the buried persons. In addition to the archaeological interest, this is also a very beautiful area, surrounded by trees and next to the sea, so you can actually enjoy wonderful sea views while exploring, and an even more wonderful sunset if you visit the site around sunset time. During the summer it is strongly advised to take with you water and hats, as you will need anything between one and three hours to explore the area, depending on how deep you are committed to go. The site pathways are rough at places as they are carved in the stone, so consider wearing comfortable shoes. The site is considered accessible to persons with disabilities, but only for viewing the tombs from above. Entrance fee is set to 4,50 Euro per person, however there are special prices for groups and entry passes for more than one days. You may buy tickets at the entrance, for further information call at +357 26 30 65 92.